Rachel Welford - life, art and architectural glass: Glass panel arrives! 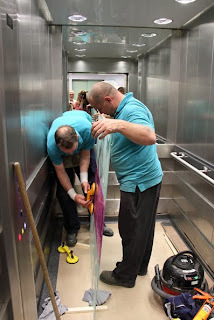 The project making glass panels for inside 5 lifts in York Hospital is moving along now. Panel 1 is a bit of a test panel, and providing it is approved we will then be making another four. This is also a collaboration with Adrian Riley of Electric Angel Design. A delivery is always an exciting time. 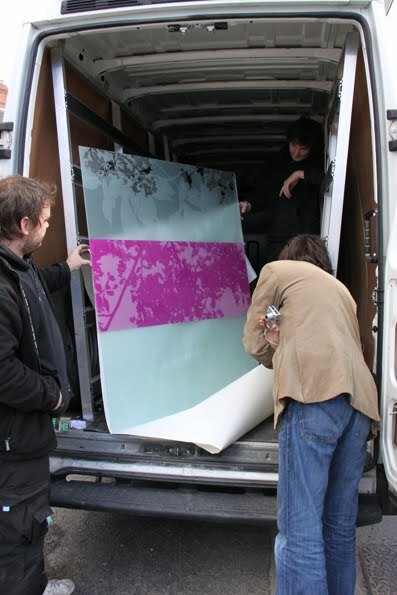 Here our sandblasted and painted glass panel arrives from Creative Glass ready for installation. Adrian inspects! The guys from Rubax Lifts start the installation. Those sucker things are great for lifting glass, although the sandblasted areas make them lose suction so they have to be quick - I was scared!